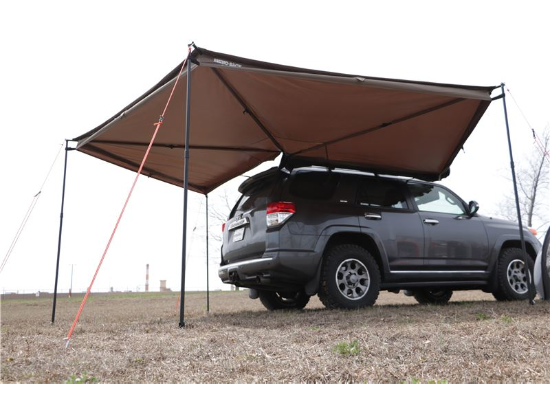 this here is a $700 shade thingie that bolts to your roof rack and unfolds. LOL. What a waste of money! Is the roof rack included?? Unless that thing is 30' across that's a rediculous price. Pete, you should start packaging tarps, poles and zipties. Add a CC logo to the tarp and sell them as a budget rooftop canopy. A 12'x12' EZ-Up is about 1/3 the price and far more useful. Plus you can still move your buggy. Yes, you could. But then you'd be ostersized from fancy dancy Jeep Meetings. You'd have to hang with MJ and XJ crowd. There are some real nice ones ($$$) that don't require any poles or guy wires. I was looking for one for my wife's FJ Cruiser when she goes to dog trials since it's just her and they are easy to open and retract. If someone is willing to pay for it more power to them. Some folks have more money than brains and will buy almost anything. Some of us are more financially challenged and have to build our own or do without. I’m normally in the second bucket and enjoy figgering out how to build my own version of things. Sometimes my version is better than what’s out there. 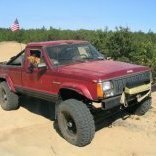 Pretty sure I could make something like that for the Cherokee out of a couple of my free harbor freight tarps, some broom sticks, a couple of cinder blocks, and string I have laying around. Won't exactly look all sharper image like the photo though. Slightly off topic, but speaking of people with more money than brains. I made something like that for my buddy several years ago. He has a full size GMC van from the local power company's surplus auction. It's 4x4 on 32's, and he turned it into an overland. I took 2 duck canvas tarps, and attached them using a heavy zipper. The 8'x12' attached to the roof rack with thumb screws, had an aluminum bar attached, and rolled up to store in a PVC pipe on the roof rack. The 2nd tarp attached coming out, and 2\3 the length. It created a small sort of privacy wall on the side with the sliding door. Pipe from Lowe's, tarps from Northern Tool, zipper from local marine upholstery shop. wow, I've got a whole bunch of those in a rack behind the barn! Some folks have more money than brains and will buy almost anything. Yet it is totally acceptable for people to put thousands of dollars into a $500 truck. My point is if you have the funds and want something go for it, even stump tables it that's what you want. Do you know how hard it is to come by stumps in metropolitan areas? Pete, you're sitting on a gold mine!